It’s citrus season down here in the south…it’s that time of year when friends and coworkers who have citrus trees are bringing in extra bags of fruit to share around with those of us who are not fortunate enough to have fruit-bearing trees of our own. What to do with all this abundance? In my case, I was gifted with some lemons (and an amazing jar of lemon curd). In the winter, I don’t think of lemonade – rather my mind turns to baking or just cooking in general. One of my favorite savory applications of lemon is to make Lemon Garlic Chicken – but since my sweet tooth is kicked in full gear right now, I wanted to make something sweet, to go with that lovely lemon curd. 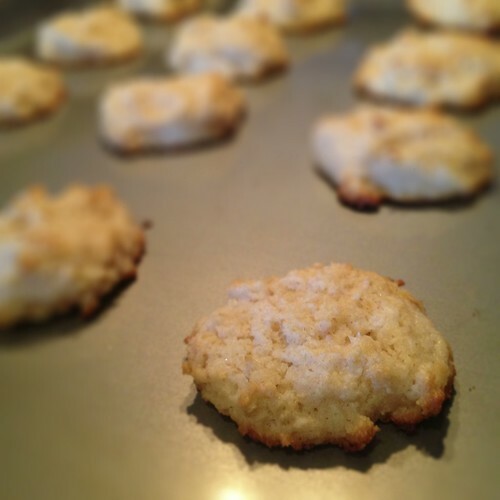 I browsed a number of my cookbooks and finally stumbled across a recipe for Lemon Drop Cookies in my King Arthur Flour Cookie Companion. The cookies are basically puffy sugar drop cookies flavored with lemon juice and lemon zest. These could easily be adapted to other citrus fruits easily. The recipe is easy and straight forward to make – the lemon flavor was present, but seemed rather delicate given how much zest and juice went into the dough. I did not opt for the lemon sugar topping, I found I prefer eating the cookies with a smear of lemon curd – and once the curd runs out, I think they would be delicious with a lemon glaze poured over the top (made by combining confectioners sugar, lemon juice and some more freshly grated zest). 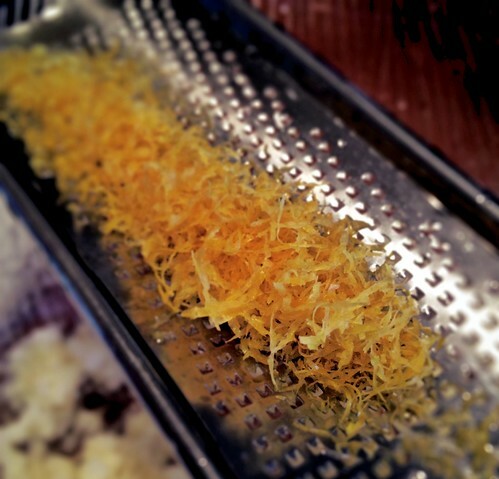 If using the lemon sugar topping, I would adapt it also to further boost the lemon flavors by blending together lemon juice, sugar and lemon zest (or even candied lemon peel) in a food processor. Preheat your oven to 350 degrees F. Prepare your cookie sheets by either lightly greasing them or by lining them with parchment. Cream together the butter and sugar. Once the mixture is light and fluffy, add the lemon juice, zest and sour cream. Stir to combine. Add in the Flour, baking soda and salt and mix to form a soft dough. Drop the dough onto your prepared cookie sheets by rounded tablespoonful. Bake 15-18 minutes or until lightly golden along the edges. Transfer to a cooling rack. Leave plain or top with a lemon glaze (after the cookies have cooled) or lemon sugar (while the cookies are still warm).